Ski Safari: Adventure Time may not be the first time that Finn and friends have made an appearance on the App Store, but it is the first time we've seen Cartoon Network team its Adventure Time gang with one of mobile gaming's biggest success stories. In this case, that means blending the endless-skiing of Ski Safari with all of the cartoon characters you love from the TV show. 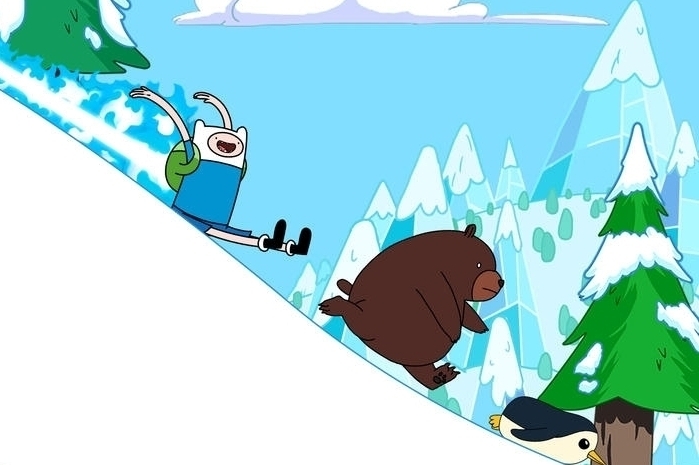 We've always been big fans of both Ski Safari and Adventure Time, so a combination of the two suits us just fine. As always the gameplay is simple but fun. Using carefully timed taps of the screen, you'll have to send your skiing character floating over rocks, or tumbling end over end for bonus points. There are loads of familiar faces too, and plenty of upgrades to unlock with the coins scattered around the handful of landscapes included. The game can be a little too fiddly on smaller touchscreens, as characters are very small and it's easy to miss an upcoming obstacle. Overall, we think the gameplay is also a little bit too forgiving when it comes to keeping a run going - and that means when you do eventually take a fatal tumble, you'll have to play for ages again to get back to chasing a new high score again. For a dollar, it's hard to go wrong with this new themed take on Ski Safari. If you've played the original to death, and you're not a big fan of the cartoon series, there's not a lot to tempt you back into paying again, but for everyone else this is a welcome fresh take on a much-loved mobile classic.